Introducing Digital Communications into Your Medical Practice discusses how electronic medical records and personal health records now digitize patient information and make it accessible for review and easy to update by both doctors and patients. The text emphasizes on how the use of email and the internet will help patients to schedule appointments, access test results and research healthcare options. In addition, topics discussed include stories on how simple everyday telemedicine tools, such as telephones with cameras attached, enable doctors and nurses to carry on conversations with patients who are homebound and need daily monitoring. The text addresses the legislative initiatives that will protect physician and patients from the unauthorized access to medical records as well as discussing how e-prescribing doctor/pharmacist teams and automated databases help patients manage their medications more effectively. Case studies are also provided to illustrate real life situations showing how this technology is deployed and why it is so critical to healthcare. Illustrations note 14 Tables, black and white; XVIII, 171 p.
In this current technological medical climate, it is vital for healthcare professionals to arm themselves and their patients with as much information as possible. 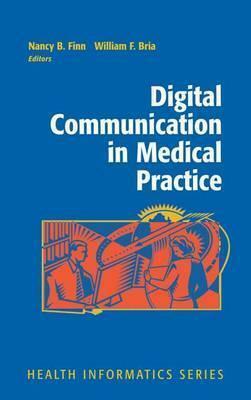 Digital Communication in Medical Practice is a concise overview of the communication tools available to every practicing physician. The book illustrates how proven communication technologies - the computer, email and the Internet, cell phones, PDAs, and video - can help doctors address the issues of too little time, too many patients and too much information. It discusses how digitization of health records makes it easier for doctors and patients to increase continuity of care by managing data collaboratively. The book discusses the convenience and efficiency of email and patient portals, how eliminating telephone tag can result in greater efficiency and better patient communications, and the value of e-prescribing, and telemedicine. It includes issues of security, privacy, and healthcare quality, as well as the legislative initiatives that have been passed to protect healthcare information from unauthorized entry. It evaluates important questions about the cost of health services and how various payment structures impact the doctor's ability to be paid a fair wage. Based around revealing case studies, the book illustrates how communication or the lack thereof can make a significant difference in treatment and outcome. It is a primer in how these important communication technologies save time and money and most importantly will reduce critical medical errors thus saving lives. A Visit to the Doctor: Three Scenarios.- eHealth and Patient Safety.- New Healthcare Models.- Communication.- Telemedicine.- Information Access: Information Overload.- Keeping Health Information Away from Prying Eyes.- Medicating Your Patients.- All About Money.- The Quality Quotient.- Heathcare 2020. Nancy B. Finn is President of Communication Resources, a consulting organization that helps small business and start-up companies communicate more effectively with customers, prospects and business, a published author and an adjunct faculty member at Bentley College in Massachusetts. William F. Bria, MD is Chief Medical Information Officer at Shiners Hospital for Children and President of the Association of Medical Directors of Information Systems.